One site I’ve recently found very helpful is Our Family Histories – ourfamilyhistories.org, especially for European backgrounds. Using this site, I’ve been able to trace back a few lines in my own family a few hundred years, and a line in Annie’s family back nearly two thousand years. I could go back even further with both, but it takes so long to move the data over, and once you get to dates that say, Before Christ, the information gets a little unreliable in my opinion. What I typically do is take the last names of people back from around the 1500-1700’s and see if it comes up with a result. For example, I put in the search Fitzroger, which is Annie’s ancestor from 28 generations back and the site had a Miles Fitzroger from 1092 in England, which is the same as what I have. I quickly check to make sure that the wife I have on record is the same as the one on the site, and that the children are the same. It all checks out. I then try to double check the parents on MyHeritage, Ancestry, and other places to see if Our Family Histories data can be corroborated elsewhere. 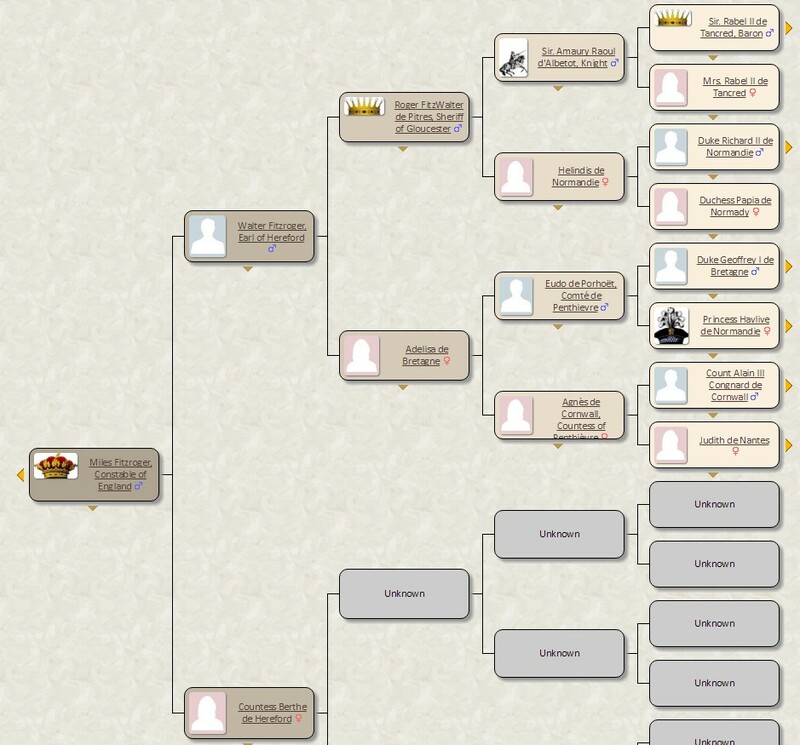 It looks good, so I get to work moving data over from the site over to the family tree. As I fill out the profiles, you can see little yellow arrows on the right-hand side. That lets me continue to follow that line backwards in time. I jumped around and found that this line can go to Italy, Denmark, Sweeden, Egypt and other areas. Egidius Syagrius is just one of thousands of end of the line ancestors that this site lists. Of course, I’ll never be able to completely prove any of this heritage, but it is interesting to consider. The site does try to list its information sources, some more sketchy than comforting. Some like Egidius have two sources, and one of them says “Personal knowledge”. I don’t know how much personal knowledge you can have of someone from around 335 AD. So is my wife related to Viking royalty? 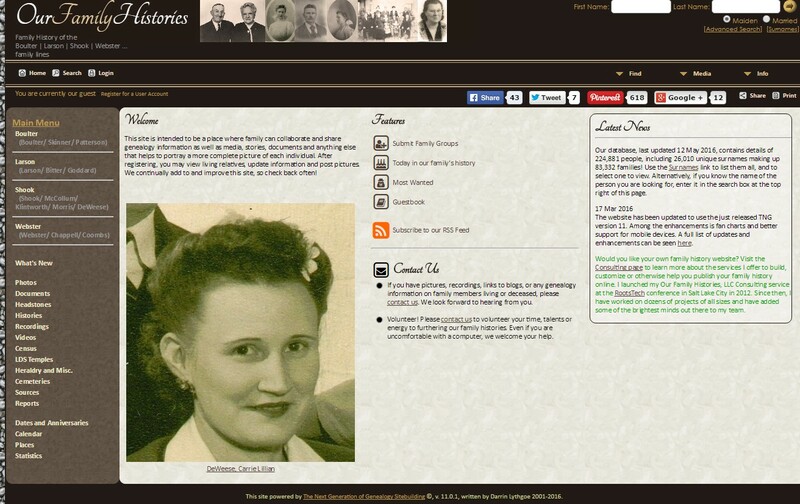 We will likely never know, but the Our Family Histories website makes very interesting connections, and some of them can be verified on other sites (though that doesn’t mean it is correct either, unfortunately). If you have information on your family tree that goes back before the 1800’s, try plugging in some last names and see if anything sticks out for you. They have a small number of records, at only 224,881 people, but when it works out, it can be a lot of fun! If you know of any other sites like this with different databases that I can search through, I’d definitely be interested! Let me know in the comments below.